Only a few days to go now. The media is either ramping up scare stories about the impending GDPR legislation – or totally ignoring it. Even though it’s not happened yet, a lot of people already seem fed up with it, this “draconian” new law which poses a threat to the way all companies operate. Some have even described it as a bomb placed under businesses that will blow away the data they hold and their rights to analyse it as they see fit. But let’s all calm down and look at it more pragmatically. If you’re not already GDPR-ready, here’s a quick way for you to prepare an overview of what you need to do. If you’re in the middle of your journey, you might still find value in this as a checklist. And if you’ve already done everything, then please reach out to me as I really want to hear about all about your process, findings, challenges and how you solved it! 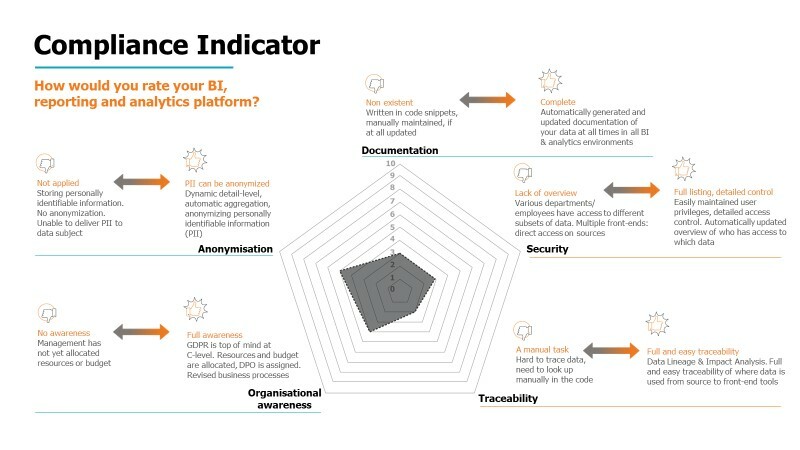 To get an overview of the process of obtaining a GDPR-compliant BI & Analytics solution, walk through the topics of the compliance indicator one by one in order to determine your company’s current state. If, for example, it scores you as being heavily manually driven as well as unable to anonymise and aggregate, then you’ll know where to focus your attention on. Some of the measures also suggests that you might benefit from adding some degree of automation to your current BI & Analytics environment. Such automation would let you and every employee working with your data focus on the analysis and data usage part, freeing you from the more tedious, repetitious tasks to IT technology solutions. In this way, automation enables your organisation to benefit in the largest possible extent from the business value that can be found within your data. Which data do you hold? Which source systems do they come from? Where is your data stored? As simple as this may sound, in some cases it might mean having to look into old hand-coded scripts that are currently extracting the data, perhaps performing transformations and then moving the data from the source system to one or more target systems. This can be complicated, especially if the person who created the original scripts no longer works for the organisation. Thankfully, modern BI platforms can automate documentation on demand, which makes it easy for you to deliver up-to-date documentation whenever an audit requires you to do so. When evaluating traceability, taking the opposite direction can also be helpful. You can ask, “In which measures is this database field from this source system used?” Preferably, you should be able to trace the use all the way to the dashboards, apps and data visualisations it is part of. A really helpful BI & Analytics implementation makes it possible for you to ‘go both ways’ when trying to trace the life of your data. This can be crucial in explaining why you are holding this data. Next, you need an overview of all the people who have access to each specific set of data. One starting point could be to describe each person by role or job function, to decide which data is relevant to that role and to grant access to them based on their reasons for needing it. When you do this, also remember to include the job functions related to IT personnel, database logfiles, back-up systems and so on. Analytics and security - do you share your business secrets without realising? Business processes comes into play here. When a customer contacts your company and asks to either see all the data you store on them or to exercise their ‘right to be forgotten’, how will your BI & Analytics solution handle this request? Often the customer data is stored in the source systems. Extracting the complete dataset for each individual might be a tiresome task if solved by querying across every relevant system. An alternative solution would be to access your data warehouse to extract the customer data. This leaves the source systems with no load due to customer queries. It would be a lot easier to assemble the data, as you only have to query one place, hence the data warehouse. Things are a little different when it comes to the ‘right to be forgotten’. In some cases, deleting data that you no longer have any reason to store might bring some ERP systems to a halt since they simply will not accept data being deleted. If this is sorted by the vendor of your source systems, you may have to add parts of the customers data to an aggregated data pool in your data warehouse and then delete the detailed dataset. For example: Sales lines representing one product at a certain price at a specific store are retained, although no customer numbers are attached to it. If you decide to store detailed data, then decide to what extent you might need aggregated tables and to what extent masking the data will be part of your solution. Does your current BI environment support automatic handling of data masking? Often it makes sense to leave the task of masking data to the data warehouse along with other things that require computational power, such as aggregations and summary tables. This approach leaves the tasks of analysis and visualisation to the front-end tools. Management buy-in is important. Without a focus on commitment from management, becoming GDPR compliant will be an even larger challenge as the process requires people’s attention, money and resources. One initiative might require new work process to handle customer requests to see their data. Who will receive these requests, carry out the work and reply to each customer? Since business processes will change, management needs to be aware of this and take control. Personal skill sets might need upgrading, extra hours budgeted for to spend on new tasks and additional software licenses invested in. Maybe now is the time for you to re-think or revise your IT data and information architecture? There really is true value to be found in GDPR compliance. It will encourage us all – every organisation that holds data – to take a closer look at which data we register and why we feel the need to hold it. A proactive approach to this might result in your marketing efforts, not just by letting your customers know that you as a company cares about their privacy but also by holding only relevant data to target the most active and receptive customers. Internally, you can reap benefits by performing a health check on your current BI & Analytics environment. Now could be the right time for data warehouse automation, governance project and security revision. Be on the look-out for a BI & Analytics platform that supports your future needs by being capable of adding more data and more sources at an ever-faster pace. Look for shorter time-to-data and the freedom of choice when it comes to using several different front-ends and analytical tools and programming languages. Seek out a platform that makes the most out of your data by supporting the decisions and insights in your company. Go for solutions that automate some of the more tedious tasks, leaving you and your colleagues time to work with the data to make them work for you. Want more? Read Why automation might be the missing link in your BI Analytics.